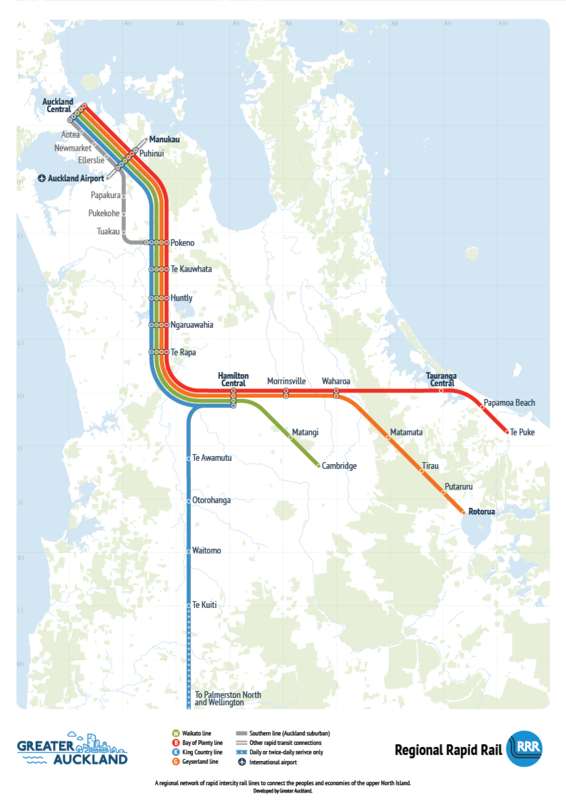 Greater Auckland is proud to present our proposal for Regional Rapid Rail – an Upper North Island Passenger Network. This post gives you a brief summary of our staged proposal to introduce higher speed inter-city rail to the Upper North Island. The full plan and the detail behind it can be seen in Regional Rapid Rail Report (8mb). This document looks amazing thanks to the design genius of Cornelius from Frontier for the design – who is also behind our website and the CFN 2.0 Report. You can also see a more detailed version of the maps for Stage 1, Stage 2, and Stage 3. Feel free to download, print, distribute, draw on, set alight, decorate your room, or re-blog, just remember to cite! The “Golden Triangle” of Auckland, Waikato and the Bay of Plenty now make up over 50% of New Zealand’s population and are expected to account for over 70% of New Zealand’s growth in the future. If we fail to provide the necessary infrastructure, we will miss out on many of the benefits from this coming growth. We need to provide a step change in intercity transit to leverage this growth proactively, rather than reactively waiting for it to congest the Waikato Expressway and Auckland’s Southern Motorway. With the Waikato Expressway almost complete, what is missing is the maximisation of the complementary rail corridors. We have the opportunity to create a well-planned, integrated Upper North Island transport system– one that is able to deliver strong economic and social outcomes, including regional development, not just for the area but for New Zealand as a whole. Connect major employment and population centres, including central business districts, growing metropolitan areas, employment areas and satellite towns in the Upper North Island. Deliver a fast and competitive rail service with a target travel time of 90 minutes from Hamilton to Auckland and under 2 ½ hours from Tauranga to Auckland. The emphasis is on quality of time and maintaining consistent and reliable speeds. Provide a regular and frequent rail service, scheduled to suit a range of travel times and trip purposes, serving commuters, tourists, students and residents alike. Make complementary improvements to the rail freight network. All upgrades should, at the least, not disturb KiwiRail’s ability to move freight now or in the future. Passenger rail network upgrades should also seek complementary improvements that also enhance the efficiency and capacity of the Kiwirail rail freight network. Assist the creation of affordable housing supply that is well connected by congestion-free transit. Use transit focused residential development to catalyse the local economies of northern Waikato towns, which face potential economic decline by being bypassed by the new Waikato Expressway. Link regional transportation to well-planned communities with good urban outcomes. This should not just be a rapid train network but the means to create vibrant, livable towns and cities that are economically and socially sustainable. Integrate directly with local public transport, walking and cycling networks, such as the Congestion Free Network 2.0, to maximise coverage and usefulness. Deliver environmental benefits by limiting the growth of long range traffic and reducing pollution and CO2 emissions, assisting New Zealand to meet its commitments under the Paris Agreement. Reduce road traffic injury and deaths, to assist New Zealand in reaching Vision Zero. Ensure value for money for taxpayer investment by optimising investment in infrastructure where it is most effective, regardless of mode. Regional Rapid Rail is a three-stage proposal to deliver higher speed rail to the Upper North Island. It has an interim stage of immediate improvements to be put into place while the main proposal, stage 2, is procured. The concept for Stage 1 is to quickly deliver an affordable ‘start up’ intercity service between Auckland, Hamilton and Tauranga using existing trains from the current fleet, running on the existing network. Stage 1 is a short term interim step, with an intended operating life of five years. The main purpose is to build ridership and confirm the viability of the regional rail concept, while significant investment in new fleet and infrastructure upgrades (Stage 2) is underway. Stage 1 is based around maximising the usage of three existing Silver Fern train sets that are currently available, running them from the existing Hamilton station in Frankton to the spare terminal space at Otahuhu in Auckland, for onward connections to Central Auckland. Apart from constructing basic rail station platforms at eight locations in the Waikato and Bay of Plenty, no major capital works or network improvements are proposed for Stage 1. The strategic concept for Regional Rapid Rail Stage 2 is to invest in new higher-speed, dual-mode tilting trains and supporting track upgrades to achieve the maximum utilisation of the existing upper North Island rail network for intercity passenger services. Stage 2 represents a significant investment programme to significantly improve train speeds, capacity and operational performance and achieve a step-change in ridership. Many of these improvements for higher speed passenger trains would also benefit freight operations. The strategic concept for Stage 3 is to improve journey times, improve service levels, and to extend the reach of the network to new towns and cities in the upper North Island. This has three main components. Firstly, doubling the size of the intercity train fleet to double capacity and halve headways, and implementing a new signalling system to allow close running at high speed. Secondly, constructing an express bypass line at the core of the network in Bombay, doubling network capacity and saving twenty minutes off all trips to or from Auckland. And thirdly, reinstating rail to formerly abandoned rights of way to extend the network Cambridge and Rotorua, and reintroducing passenger rail to the freight network east of Tauranga. By creating a true multi line network of integrated, frequent and fast train services, Stage 3 will combine the separate economies, housing markets, and job markets of the upper North Island into a single highly-productive powerhouse for the New Zealand economy. The time for Regional Rapid Rail is now. A step change in fast, sustainable inter-city land transport is required to integrate the economies of the cities and towns of the Upper North Island. Consistent travel times of less than 90 minutes between Hamilton and Auckland and less than 60 minutes between Hamilton and Tauranga will result in over half the population of New Zealand being linked together into a single economic entity. The regular and frequent service schedule running all-day, seven days a week would support a robust and sustainable economy, providing for a range of trip purposes and serving commuters, tourists, students and residents alike. Regional Rapid Rail is not just a plan for fast trains, it is a regional development proposal that will help structure population growth and development on a national scale. Investments in new rapid trains and track upgrades will leverage the existing rail network infrastructure, allowing it to provide a fast and high capacity passenger system to complement the state highway network. Without rapid passenger rail, the Waikato Expressway and connecting highways risk being overwhelmed by commuter traffic, as suburban development continues to spill over from the main centres to the towns of the Waikato and Bay of Plenty. At the same time, without Regional Rapid Rail to catalyse new development and reinvigorate local economies, the newly bypassed towns of the Waikato face economic decline as traffic-dependent dormitory suburbs. Regional Rapid Rail is an affordable proposition for infrastructure of national significance, giving complementary benefits to both the movement of people and the efficiency and performance of freight. The Stage 2 investment of $400 million dollars, comparable to one section of an expressway bypass, buys a comprehensive three-line rapid rail network linking Auckland, Hamilton and Tauranga to each other, and to their satellite towns and villages. The Stage 3 network of $1.5 billion would revolutionise transport in the Golden Triangle area, for the price of one rural motorway. With remarkably fast train services linking almost all towns and cities of the growth regions of Auckland, Waikato and Bay of Plenty to each other, Regional Rapid Rail will place more than half of the New Zealand population and economy on one efficient and effective transit system. So we hope you like Regional Rapid Rail, stay tuned for more posts to come on the details of the scheme and what it means for New Zealand. Please give the full report a read, and please if you like Regional Rapid Rail share on social media or with people you know. 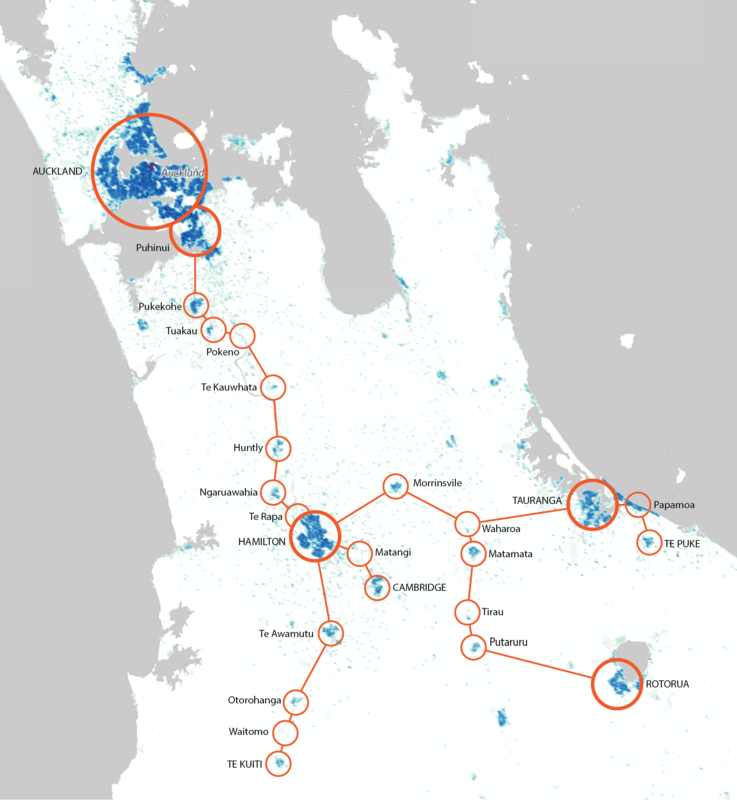 The final Regional Rapid Rail network overlaid on a population density map of the Upper North Island. This places half the population and economy of New Zealand on one transit system. Q: What is a tilt train? A: A tilting train is a train that is designed to tilt into a curve to allow it to corner better at higher speeds. The main reason that conventional trains are required to slow down for curves is for the comfort of passengers. The limit at which a speeding train would derail on a tight corner is far beyond the level where people inside the cabin would experience uncomfortably strong lateral forces. Tilting trains are a cost-effective way to considerably improve cornering speeds on existing mainline tracks, for this reason, tilt trains can be found across the world including in Queensland as well as Japan. Q: How fast could trains actually go in New Zealand? A: 160 kilometres per hour is the feasible maximum service speed for tilt trains running on New Zealand’s narrow (1067mm) track gauge. Trains running on the same gauge achieve this speed in passenger service in Australia and Japan. This would require new purpose-built trains and track upgrades. Q: Don’t tilt trains cause motion sickness? A: Motion sickness was an issue on first generation tilt trains designed in the 1960s and 1970s, these used passive mechanical tilting systems that suffered from lag and jerkiness. This problem has been solved by modern computer controlled active tilt systems that predict curves using GPS and have smooth electric or hydraulic control. Q: What is a dual mode train? A: A dual mode train is one that can work on multiple propulsion systems. In this case, the rolling stock would be able to run on 25kvAC electrification of the NIMT and Auckland network as well as have a diesel-electric engine when the train is not under the wires. This means that electrification of the whole network is not mandatory making the programme much more affordable and feasible. Q: I thought Dual Mode Trains were not allowed on KiwiRail network? A: This restriction only applies to the freight locomotives which are much heavier and whose weight is spread over fewer axles. KiwiRail has confirmed to us that Dual mode multiple unit passenger trains are ok for the current network. Q: What if the Silver Ferns do not work? A: The Silver Ferns are old but serviceable. If the Silver Ferns are not feasible in practice, then investigations could be done into upgrading ADL Class DMUs, or SA set carriages for intercity travel. The latter would also require the leasing of locomotives. Another option would be to procure a small tranche of new rolling stock as proposed for Stage 2, but using it to run the Stage 1 pattern. Q: Wouldn’t it be better to procure the new rolling stock straight away compared to older trains? A: Potentially, that would be a discussion for Central and Local Government. We would have no objection to this. However, there would be approximately five years lead time to fund, contract, build, deliver and commission a new train fleet. Stage 1 as proposed was intended as a demonstration network, to start operations in the interim while this procurement process is underway. Q: Won’t this negatively affect KiwiRail’s freight movement? A: We have been conscious and respectful of KiwiRail’s freight movements in this proposal. Objective number three of Regional Rapid Rail is that any upgrades should not cause any long-run problems to KiwiRail’s ability to move freight and meet New Zealand’s freight growth. Where possible, any rail upgrade should also seek to enhance KiwiRail’s rail freight potential. Q: Is a Bombay tunnel really necessary? A: Not necessarily, however, we have proposed these ideas so that Government can consider protecting the corridor now so the option is not taken away in the future. The need for expanded transport corridors often comes just after the corridor has been built out by the very development that has caused the need for additional transportation capacity. Too many times we have seen a lack of corridor protection resulting in increased cost or making a project unviable. Q: Is this proposal all about Auckland? A: We don’t see this as just about Auckland but enabling regional development across the Golden Triangle of Auckland, Waikato and Bay of Plenty. The proposal provides as much capacity to leave Auckland and access regional areas as it does the other way around. While Auckland is still highly likely to be dominant, Hamilton is perhaps the greatest beneficiary of this network. The aspiration is not the Golden Triangle cities and towns simply become a periphery of Auckland but great liveable places as well all connected to each other. Q: Could Regional Rapid Rail be applied to other parts of the country? A: Regional Rapid Rail could also be expanded to other parts of New Zealand. Networks focussed on Wellington and Christchurch are the obvious candidates. For an expanded network based around the Capital Connection between Palmerston North and Wellington, the same dual mode diesel – electric tilting train stock could be procured. However, would simply have a 1600v DC traction system instead of 25kvAC to work with the current Wellington electrification. The rolling stock could improve capacity, speed, amenity, and environment for this existing route. A higher speed train link from Christchurch to Dunedin, via Oamaru and Timaru, could be implemented on an upgraded South Island Main Trunk. The rolling stock would only need to be diesel powered unless future proofed for electrification. The service could also simply be Timaru or Ashburton to Christchurch if found to be more feasible.